The launching of Musikiwest was a huge success and accomplished all and more than we had imagined. We met our moderator, psychiatrist Dr. Rona Hu, at our first rehearsal. As we worked, Dr. Hu observed our working process and interactions. She helped us imagine and own into our roles we would take on in our “open rehearsals” for the students of The Palo Alto Unified School District. It was difficult to rehearse bullying each other, shaming and being just plain rude. However, when we saw the strong reactions elicited from the students in the classrooms, we were empowered to carry on our roles as authetically as possible. With the guidance of Dr. Hu the students were invited to reflect on what they observed in our collaboration and suggested alternate ways of behaving to help in resolving our conflicts. In the process we were reminded, adults and students alike, that no one is alone in having endured bullying and sometimes even delivered some ourselves. Learning to recognize destructive behavior is equally as important as having the courage to intervene and help when you witness it. The magic of teaching this through chamber music is that so much of what we did had nothing to do with words but with our actions. The concert in Mitchell Park Community Center that closed our week on Nov. 30 was spectacular! The feel in the space is very cool and unpretentious, acoustics are very clean and clear, the audience is close to the action. We stand so there is no visibility issue except of course for the cellist who is on a riser. Kristin Lee and Ian Rosenbaum rocked Deciduous by Andy Akiho, I can’t get enough of that piece. And that was the most satisfying delivery of Mariel by Golijov that I have ever made with Ian on marimba. Comments from our enthusiastic audience were overwhelmingly positive. Someone said they couldn’t believe it would be any good because the tickets were so cheap! 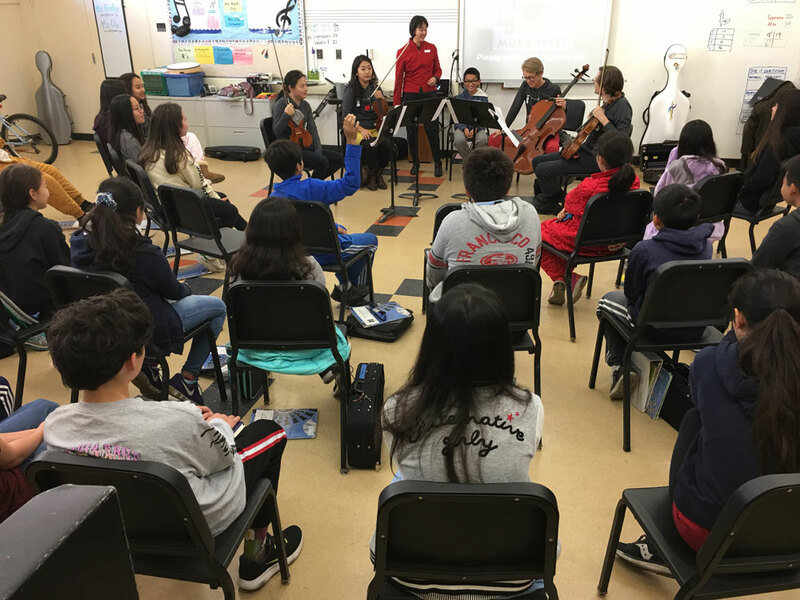 Musikiwest breaks barriers, we surprise you with our program both on stage and in the classrooms, we may even change your assumptions about classical musicians. We invite everyone to enjoy our performance in a setting that belongs to the community and at an affordable price (18 and under are free! ), most importantly, we aspire to engage the youth of today to become the great leaders of tomorrow. Mark your calendars now for April 19th, you really want to hear this program of rarely heard String quartets gems by movie composers John Corigliano and Erich Korngold and the Five World Dances of Sergio Assad for guitar and string quartet!!! Thank you to my colleagues for your willingness to join Musikiwest on our quest to build peaceable communities, thank you to the teachers and administrators of the PAUSD for allowing us to interact with your community of students, thank you to our audience that turned out for our concert, and thank you to those who have made this program posssible through their generous contributions. Here are a few pictures of some of the classroom events from our fall launch. Stay tuned for a video release of our first week as well as some sound clips from the concert. 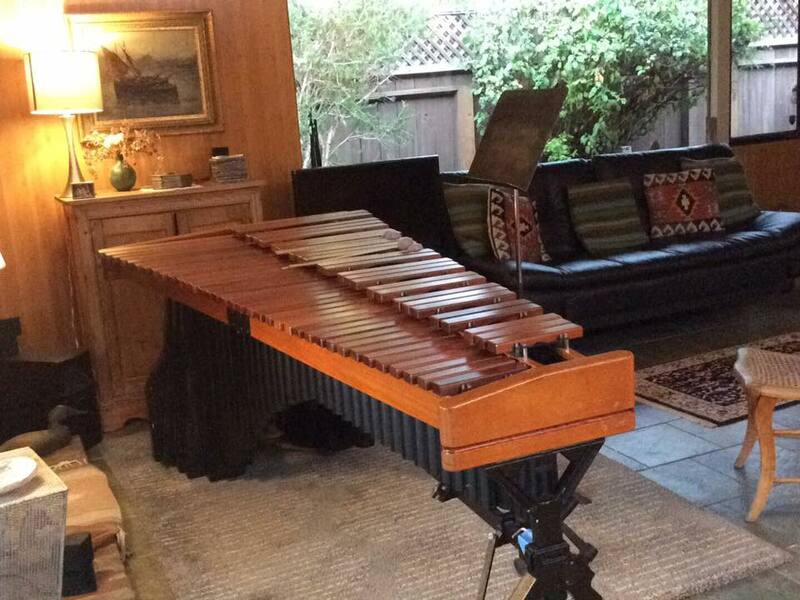 Getting ready to rehearse with the marimba! 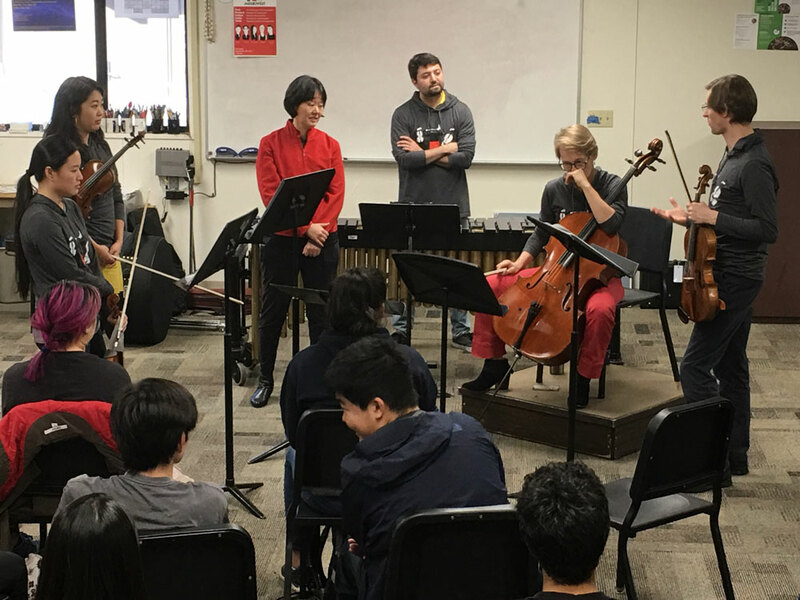 Musikiwest musicians and Dr. Rona Hu sit talking with student. 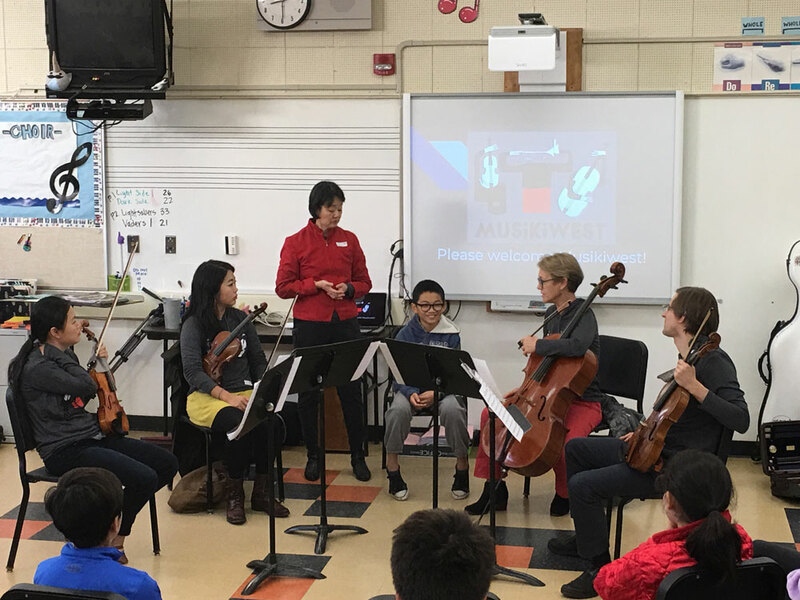 Musikiwest performers working their way through the "problem" with Dr. Rona Hu while students look on.